In addition to fruitcakes and crowded shopping malls, holiday travel is one of the low points of the holiday season, no? Unless you’re actually into standing in check-in lines behind a crying baby with a full diaper. If that’s your pleasure, you’re a stronger person than I. How do you survive hours in the car, delayed flights and nights spent on pull-out couches without losing your mind? Be Prepared. I have a friend whose life motto is ‘always pack a snack.’ Like, she applies this to her personal and professional life! And chances are, your holiday travel will be exponentially more awesome if you’re sustained by some smoked almonds and dark chocolate. And you know what else you should bring? A neck pillow (I swear by this one), ear plugs, slippers, moisturizer, hand sanitizer, gum, and the phone numbers of your host/hotel/airline. Even if your flight gets delayed, you hit a traffic jam or you find yourself sleeping on a cot in the hall, you can (probably) emerge from the ordeal looking and smelling good. Obviously, most of your traveling will consist of sitting – at the gate, on the plane, in the car. And sitting, not surprisingly, in not terribly fun. But good lord! Surely you’re clever enough to entertain yourself right?! You can always read something light and fun, do some Sudoku, listen to podcasts (I love This American Life) or play one of a million games on your iPhone. But how about some old school people watching? Or a game of Would You Rather? If you’re in the car, play license plate bingo or annoy everybody by singing 100 bottles of beer on the wall.Or you could do always do kegels. So give your budget and your schedule a bit of wiggle room and you’ll be a lot happier. It’s also worth remembering that the annoying guy in front of you who’s causing a scene at the baggage claim? He’s not trying to be salacious, he’s just stressed out and tired, like everybody else. And the baby that’s howling behind you? She’s not on a personal mission to give you a migraine. Take a few deep breaths, imagine yourself tucking into some mashed potatoes alongside your favorite aunt and try to remember that getting there at 5:45 instead of 4:30 is not going to be the end of the world as we know it. If you can’t stomach the idea of sitting idly on a plane for three hours, you can certainly use your time to read A Very Important Book you’ve been meaning to get to, plot your plans for the New Year, write your Christmas cards or work on your novel. One of my favorite things to do on any return flight is compile a list of my 100 favorite memories from the trip while they’re all fresh in my mind. It’s sliiightly more rewarding than watching that screening of Old Dogs that the airline is showing. Are you traveling far this holiday season? 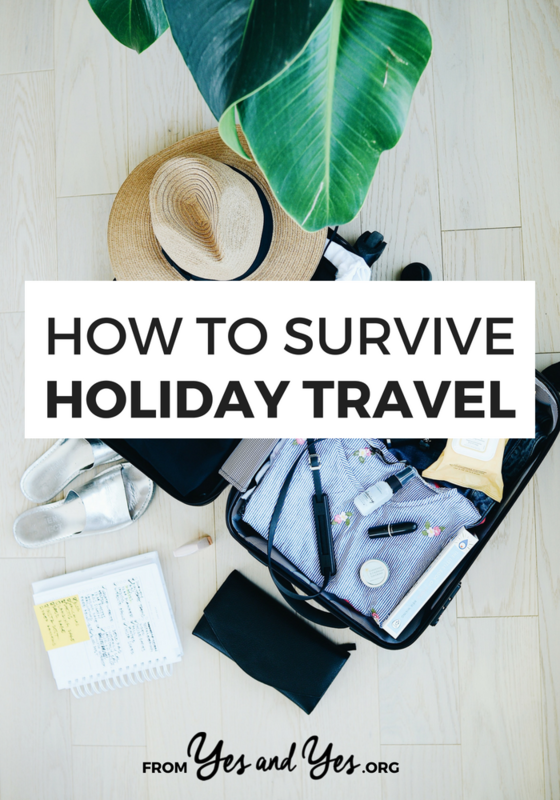 How do you survive holiday travel? This is a really great post- on planes, I like to read books or write lists. Especially writing list. I get most of my Very Valuable Vacation time at the holidays, and as such I do holidays at home. People can come over, but I'm not going anywhere. But if I were, I love indulging in trasy novels on long flights. I really like the idea of writing 100 favorite memories from the trip. I did this once when I went on a ski-trip with my parents, and re-reading it is quite entertaining. I travel a lot and my favorite way to de-stress is to think of how I'm going to make my travel story funny for my family and friends. This helps because I then 1. distract myself, 2. put the situation in a somewhat positive light (even if I'm making fun of the fact that the airline lost my luggage) and 3. my loved ones are extra excited to see me, because chances are I have a hilarious story to tell when I get there. Like the time I rode home with a busload of parolees from the Georgia chain gang and one of them tried to claim me. Sounds scary but when I mentally worked on putting it into a narrative it ended up being really funny! Since last Christmas travel plans were hectic to say the least, but this year I'm traveling with my parents, I plan on not worrying about anything! Seriously, I want them to hold on to my passport, I'm just going to act like a carefree child to avoid all the airport stress! I've never been able to sleep on buses, so entertaining myself for that long is going to be a challenge. Thanks for the ideas and the encouragement. I also bring reading material, extra layers (that air con is often very strong), food and something to drink. Now I must get into your inflatable neck pillow suggestion, it sounds pretty comfy !